Fact Check: Is Trump or Obama Behind Booming Economy? President Trump and former President Obama both claim credit for the economy. Democrats argue that Trump inherited an economy that was already strong, while Republicans insist he turned it around. 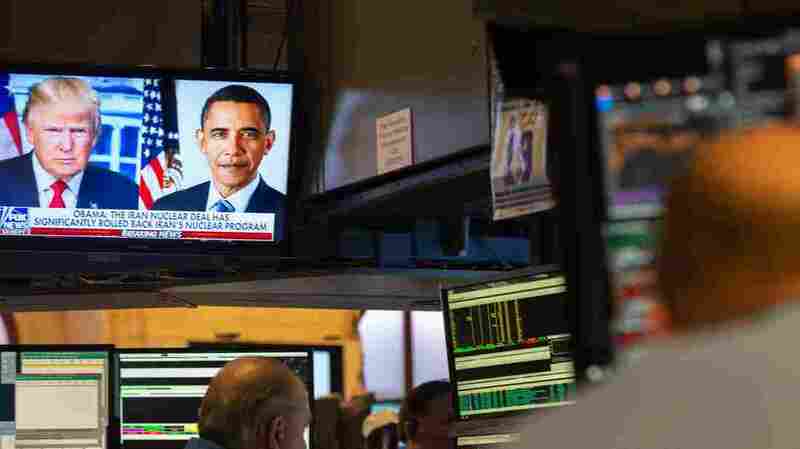 Images of President Trump and former President Barack Obama are on television as traders work on the floor of the New York Stock Exchange. "When you hear how great the economy is doing right now, let's just remember when this recovery started," former President Barack Obama told supporters Friday at the University of Illinois. This is not just a question of bragging rights. With midterm elections less than two months away, voters' impressions of who deserves credit for the boom could influence which political party they support in November. Let's stipulate that presidents of both parties often get more credit and blame for economic conditions than they deserve, given that much of what happens is outside their control. But setting that aside, is Trump simply coasting on the momentum of an already strong Obama economy? Or have things turned around on his watch? White House economist Kevin Hassett insists that Trump deserves the credit. "I can promise you that economic historians will 100 percent accept the fact that there was an inflection at the election of Donald Trump and a whole bunch of data items started heading north," said Hassett, who chairs the council of economic advisers. "Inflection" is just a fancy word for turning point. So Hassett is arguing that conditions since Trump was elected are significantly different than conditions were before. It's hard to see such a turning point in major economic yardsticks such as jobs, unemployment, or wages. 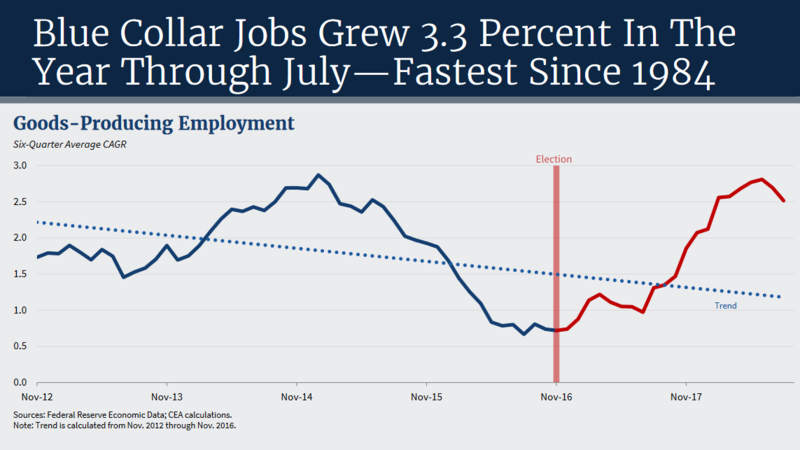 Job growth has been remarkably consistent since the end of the recession in 2010. The 3.6 million jobs added in the 19 months since Trump took office are roughly comparable to the 3.9 million added in the previous 19 months under Obama. Likewise, unemployment has steadily declined. And wages have inched up at a slow but steady pace. On a graph of any of these metrics, the period before Trump took office is virtually indistinguishable from the period since. "At best, you would say it's been a continuation of a steady trend," economist Austan Goolsbee told MSNBC. Goolsbee, who had Hassett's job early in the Obama administration, challenged the idea that things suddenly improved following Trump's election. "I don't see how you come into the game with 10 minutes left in the fourth quarter, your team is already ahead, and you're like, 'I won this game.' "
But Hassett presented his own charts to back up the idea of a Trump turning point. Job growth in goods-producing industries has accelerated under President Trump, even as growth in the much larger services sector has slowed. Goods-producing employment has accelerated since Trump took office, even as job gains in the much larger service sector have slowed. As Mark Muro and Jacob Whiton of the Brookings Institution have noted, that could be helpful to Republicans in November, since goods-producing jobs tend to be concentrated in redder, more rural parts of the country. "As the elections approach, smaller, redder places are doing relatively better than they were in 2016," Muro and Whiton wrote. It's important to remember, though, that goods-producing jobs make up a relatively small slice of the overall U.S. economy, accounting for less than 14 percent of the total workforce. By focusing on those jobs, the Trump administration is discounting the industries that employ 86 percent of American workers. 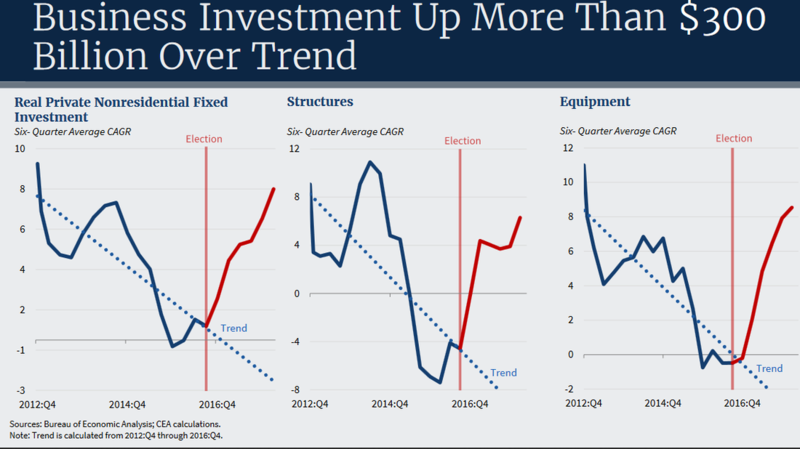 Hassett also highlighted a surge in business investment in property, plants and equipment beginning around the time that Trump was elected. "What's happened is that the capital spending boom that we promised would happen if we passed the tax cuts is underway," Hassett said. In theory, that additional investment should make workers more productive, boosting both output and wages in the future. But not everyone is convinced that the boom is widespread or that Trump and the tax cuts are responsible. The president of the federal reserve bank of Atlanta says much of the increased investment is in the energy sector, driven by higher oil prices. "Excluding energy and oil investment, investment growth is still below 5 percent on a year-over-year basis — a bit lower than the typical expansion average," Raphael Bostic told the Savannah, Ga, Rotary Club in June. NFIB members were much more optimistic about the economy after the 2016 election. 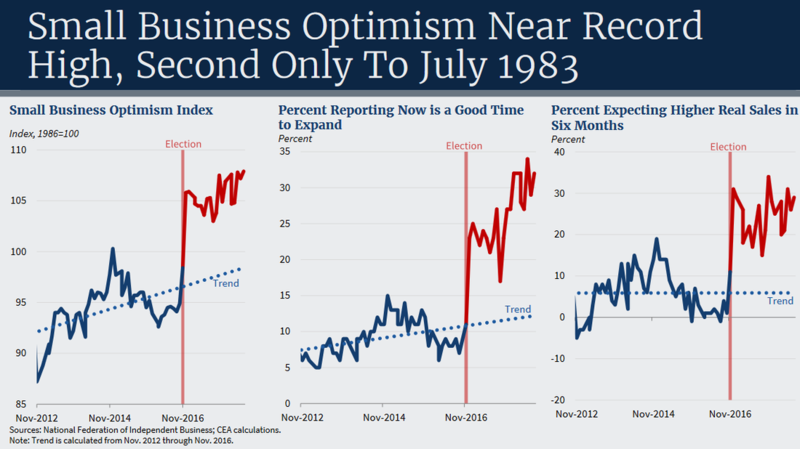 One area where there is a clear, election-related turning point is small-business sentiment. Members of the NFIB, a Republican-leaning small-business group, were significantly more optimistic after Trump's upset victory in 2016, perhaps anticipating his policies of tax cuts and reduced regulation. "People started to ratchet up their expectations for what would happen to the economy," Hassett said. "Everybody, except for Mrs. Clinton's supporters, was starting to do that right after the election." Significantly, Hassett did not highlight GDP growth, perhaps because the measure has bounced up and down and would not show a clear difference between Trump and Obama. Although Trump often boasts about the strong GDP showing between April and June — when growth topped 4 percent — there were quarters during Obama's tenure when growth was even stronger. Forecasters disagree about whether Trump can deliver sustained, multiyear growth in the 3 percent range, as promised.